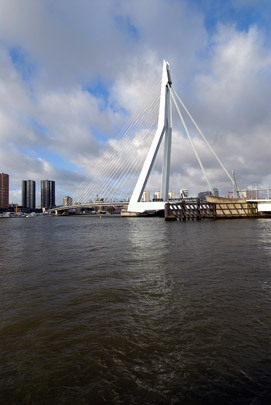 Following the success of the Willems Bridge and convinced of the monumental symbolism a bridge can emanate, the City of Rotterdam decided that the new suspension bridge should symbolize Rotterdam in the year 2000. From the very first sketches, the 'Swan', as this expressively angled pylon level with Noordereiland was immediately dubbed, has caught the public imagination. The bridge's design has been thought through down to the smallest details. Van Berkel & Bos also designed the approaches and a pleasure-boat booking office with single-level car park on the north bank.